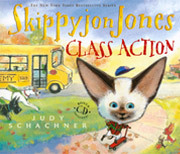 Skippyjon Jones really wants to go to school. School is for dogs, his mama tells him. It's where they go to get trained. But nothing can stop Skippy-once inside his closet, he finds himself on the playground of his imagination, surrounded by dogs of all kinds. He bays with the beagles, learns French with the poodles, and checks out a Chihuahua book from the library. And when a bully starts sending shiver-itos down the spines of the little yippers, Skippy saves the day and earns the biggest gold star.